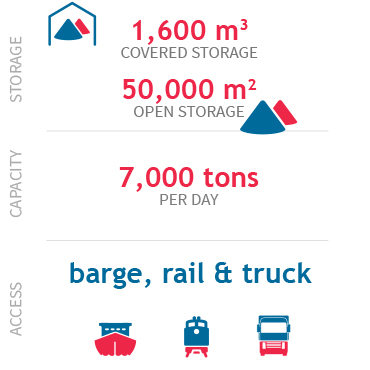 HES Dillingen Bulk Terminal is specialized in the storage of various bulk products. The company is ideally situated in the port of Saarlouis / Dillingen along the river Saar, close to the French border and in close vicinity to major industrial plants and factories. HES Dillingen Bulk Terminal serves both the local industry as well as international trading and industrial clients. The terminal’s facilities include a large paved area and covered storage. Furthermore, HES Dillingen Bulk Terminal has a Ro-Ro loading ramp, a quay for heavy lifting and a multipurpose crane for dry bulk and breakbulk cargo.